Each of the eight series includes six Bible lessons that can be expanded into 30 sessions! Preschoolers and young children will love the colorful visuals, fun games, easy crafts, lively songs, memory verses and more! Free fun reproducible activity sheets are available to download for each series. 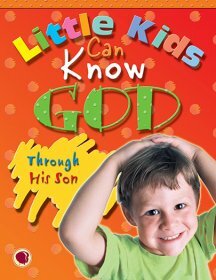 All suggested songs in this series are in the Little Kids Can Know God songbook and CD combo. Kits include flashcard visuals and one teacher text. The Angel Told the News, God Is So Good, God Made Me, God Made the Mountains High, God Makes Me Glad, Have You Any Fear?, Have You Heard about Jesus, Hear God's Word, I Believe the Bible, I Can Know God, I Can Pray, I Will Trust, Jesus Loves Me, Jesus' Love Is Sweet and Wonderful, Nothing But the Blood, Oh Be Careful, Praise Him, Praise Him, The Prayer Song, Tell the Story True, Three in One. 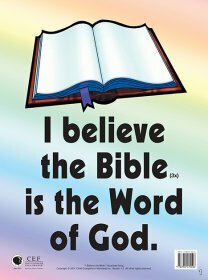 Help kids learn that the Bible is not just another book, but truly God's Word. The simple words and pictures make this classic visualized song excellent for young children. 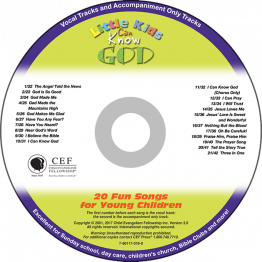 CD includes 20 songs recommended in the Little Kids Can Know God lesson series. 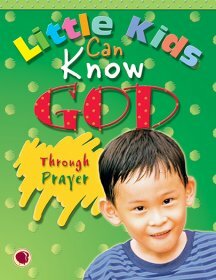 A dynamic collection for any preschool ministry. 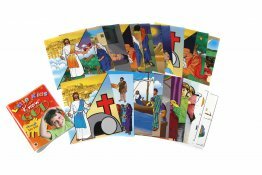 Full-color flashcard visuals for Little Kids Can Know God through Creation. No teacher text. Great if you need additional visuals, or have teacher text in another language. As young children learn about God, their Creator, they learn that He loves them and sent the Lord Jesus to be their Savior! Four lessons cover the days of creation; the last two teach about Adam and Eve’s sin and Cain and Abel’s gifts to the Lord. 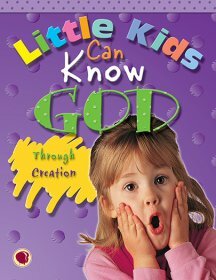 Same teacher text for Little Kids Can Know God through Creation that is in the kit. Lesson outlines, detailed story line, review questions, craft ideas, reproducibles, music and more. Handy if you are team teaching - each teacher can have a text without purchasing two complete kits. 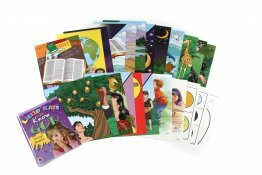 Spanish teacher text for Little Kid Can Know God through Creation. Everything the teacher needs to teach preschoolers and young children. 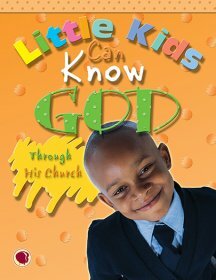 Same teacher text for Little Kids Can Know God through His Church that is in the kit. Lesson outlines, detailed story line, review questions, craft ideas, reproducibles, music and more. Handy if you are team teaching - each teacher can have a text without purchasing two complete kits. 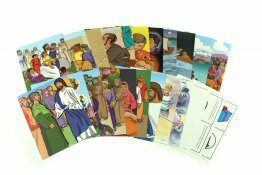 Full-color flashcard visuals to teach six lessons on the miracles of Jesus. No teacher text. Great if you need additional visuals, or have teacher text in another language. 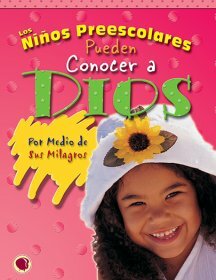 Spanish teacher text for Little Kids Can Know God through His Miracles. 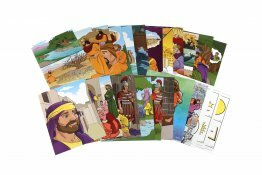 Full-color flashcard visuals to teach six lessons of the promises of God through the lives of Noah, Abraham and David..No teacher text. Great if you need additional visuals, or have teacher text in another language. Lessons on Noah and the flood, Abraham’s faith, Isaac’s new bride and David with Goliath and Mephibosheth teach young children that God always keeps His promises. 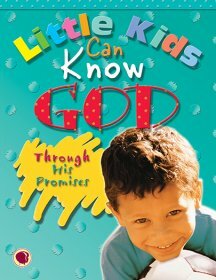 Same teacher text for Little Kids Can Know God through Promises that is in the kit. Lesson outlines, detailed story line, review questions, craft ideas, reproducibles, music and more. Handy if you are team teaching - each teacher can have a text without purchasing two complete kits. 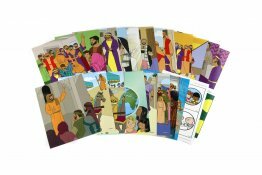 Full-color flashcard visuals to teach six lessons on the birth and early ministry of Jesus. No teacher text. Great if you need additional visuals, or have teacher text in another language. The first three lessons share the angel’s message to Mary then Joseph, the birth of Christ and the visit of the shepherds and wise men. The final three lessons present the Savior as a child amazing teachers in the temple then as an adult calling disciples to follow Him. 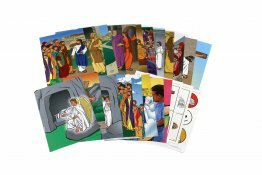 Kit includes 9 5/8' x 13" (24.4 x 33 cm) flashcard visuals and teacher text. 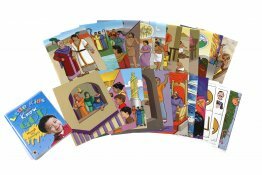 Spanish teacher text for Little Kid Can Know God through the Son. 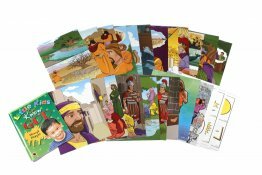 Lessons on the lives of Joseph and Moses, the four Hebrews in the fiery furnace and Daniel in the lions’ den help young children know God, who controls all that happens. 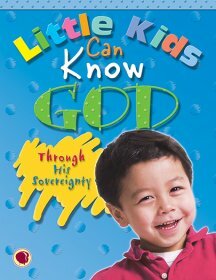 Same teacher text for Little Kids Can Know God through His Sovereignty that is in the kit. Lesson outlines, detailed story line, review questions, craft ideas, reproducibles, music and more. Handy if you are team teaching - each teacher can have a text without purchasing two complete kits. Lessons on Elijah’s contest, Jonah’s sin, Nehemiah’s wall, Jesus’ prayers, Peter’s deliverance and a jailer’s salvation. 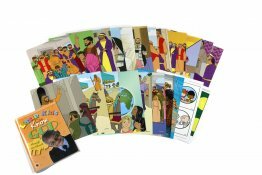 Kit includes 9 5/8' x 13" (24.4 x 33 cm) flashcard visuals and teacher text. 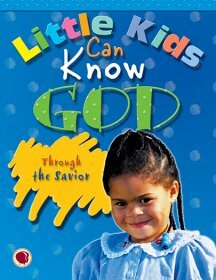 Same teacher text for Little Kids Can Know God through Prayer that is in the kit. Lesson outlines, detailed story line, review questions, craft ideas, reproducibles, music and more. Handy if you are team teaching - each teacher can have a text without purchasing two complete kits. 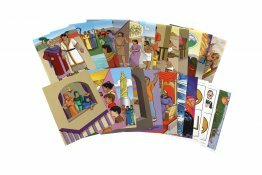 Full-color flashcard visuals to teach six lessons from the book of Acts. No teacher text. Great if you need additional visuals, or have teacher text in another language. 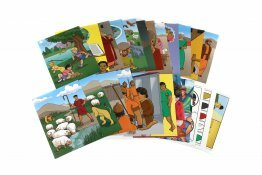 Full-color flashcard visuals to teach six lessons on the lives of Joseph, Moses and Daniel. No teacher text. Great if you need additional visuals, or have teacher text in another language. 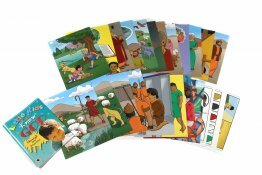 Full-color flashcard visuals to teach six lessons from the Old and New Testament of different types of prayer. No teacher text. Great if you need additional visuals, or have teacher text in another language. 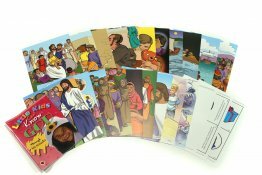 Full-color flashcard visuals to teach six lessons to help young children learn that God loves them and sent the lord Jesus to be their Savior. No teacher text. Great if you need additional visuals, or have teacher text in another language. young children discover the Savior, who loved them enough to give His life. Kit includes 9 5/8' x 13' (24.4 x 33 cm) flashcard visuals and teacher text. 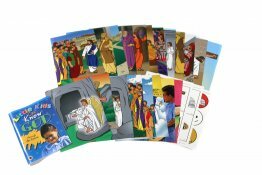 Same teacher text for Little Kids Can Know God through the Savior that is in the kit. Lesson outlines, detailed story line, review questions, craft ideas, reproducibles, music and more. Handy if you are team teaching - each teacher can have a text without purchasing two complete kits. of Jairus’s daughter and Lazarus help young children know our miracle-working God! 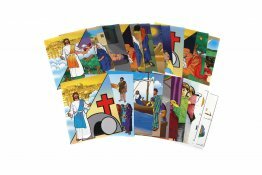 Kit includes 9 5/8' x 13" (24.4 x 33 cm) flashcard visuals and teacher text.